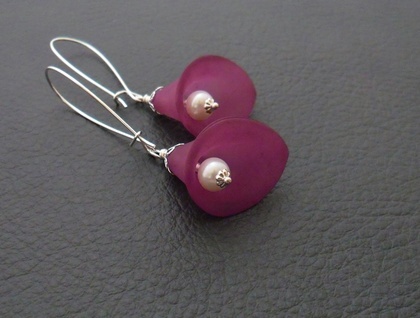 Rich, plummy purple calla lilies with white glass pearl centres are suspended from silver plated ear-wires. Each lily is topped by a lacy, silver-plated filigree bead-cap, and each imitation pearl is cupped by another silver-plated bead-cap in a more floral style. 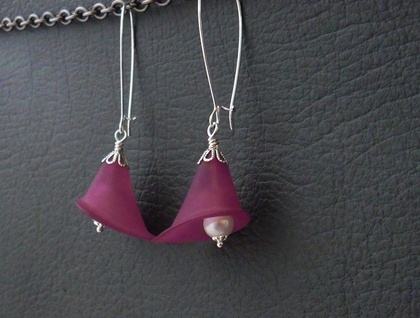 These earrings are lightweight and easy to wear. The lily flowers are acrylic, with a matte texture and a frosted, semi-opaque appearance; slightly more translucent than they appear in the photographs. They have a wonderfully graceful, bell-like shape, and are designed so that the tips of the lilies sweep away from the wearer's face. All metals are silver plated. 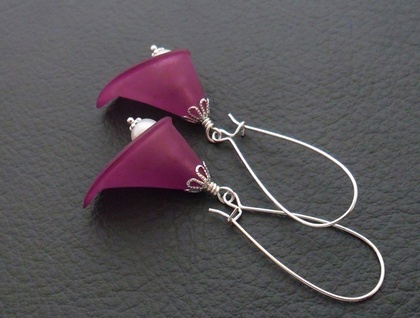 Other lily earrings, in other colours, are also available here in my Felt shop. 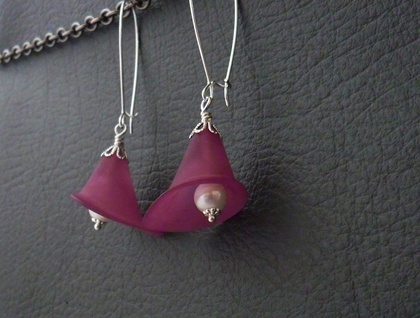 The earrings measure 58mm from top to bottom. The lilies are 26mm long, including the wire-wrapping, and 26mm wide. The silver plated ear-wires are without nickel; however, if you would prefer stainless steel, silver plated ear-wires, just let me know in the 'notes for silverlight' field that will appear when you check out of Felt, and I'll change the ear-wires at no charge. The stainless steel ear-wires will shorten the length of the earrings by 4-5mm.